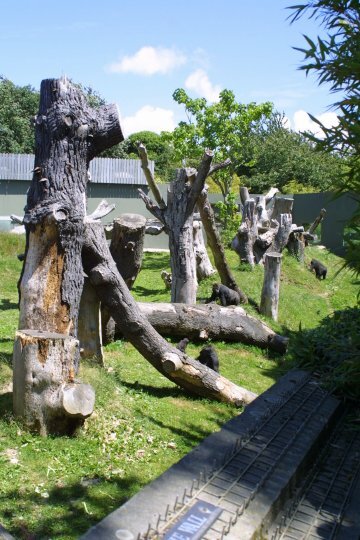 Jersey’s gorillas live in a large enclosure that has a 2000sq metre (½ acre) grassy outdoor area containing many tree trunks and ropes for climbing. The ground has been carefully landscaped to provide varied terrain and areas with a degree of privacy. There is also a pond and waterfall system. 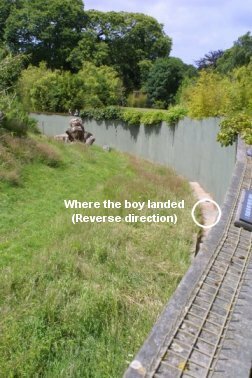 A high wall surrounds the outdoor enclosure, but because the centre of the area is higher than the wall, from some areas of the Zoo it can appear that a gorilla is sitting on a hill in the grounds and not in an enclosure at all. Indoors, where the gorillas sleep and seek shelter during poor weather, there is a glass-fronted public viewing area, partially covered by camouflage netting this allows the gorillas a degree of privacy. Spikes and warning signs have now been fitted to the tops of the walls. Map showing a small area of Jersey Zoo and the Gorilla Enclosure Complex. 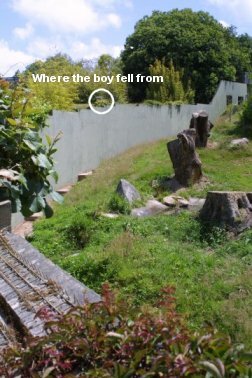 The Gorilla House can be seen on the left of this photo. The raised mounds give an excellent view of the Gorillas.